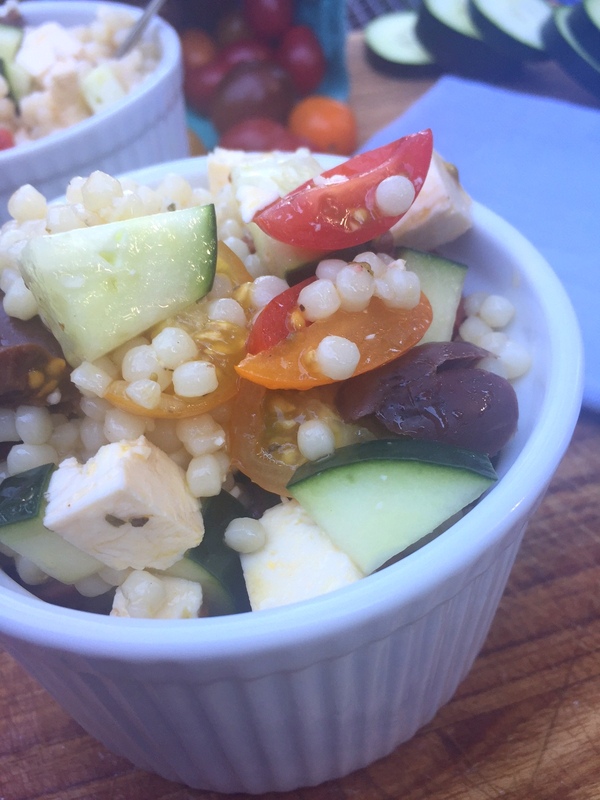 My first introduction to couscous salad was in Paris. And it was love at first taste. In fact, it became my comfort food as I was on my first international trip and the furthest from home thus far in my life at the age of 20. Being the novice that I was with food at that time in my life, when I returned to the states, I could not figure out how to replicate the recipe. Keep in mind this was in 2000 – the internet was not the resource it is today. (Did we even have the internet we have today in 2000???). 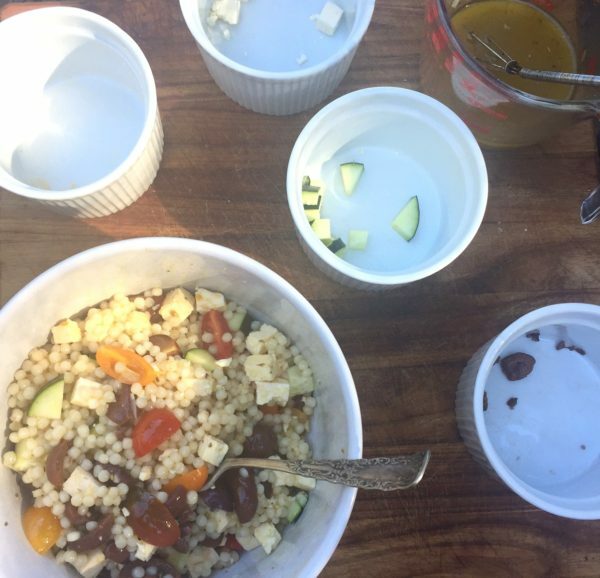 Anyway, I never forgot the many picnics I had in les jardins in Paris with my baguette, ham, my disbelief and absolute awe that I was finally in the city I had been dreaming about, and yes, couscous salad. 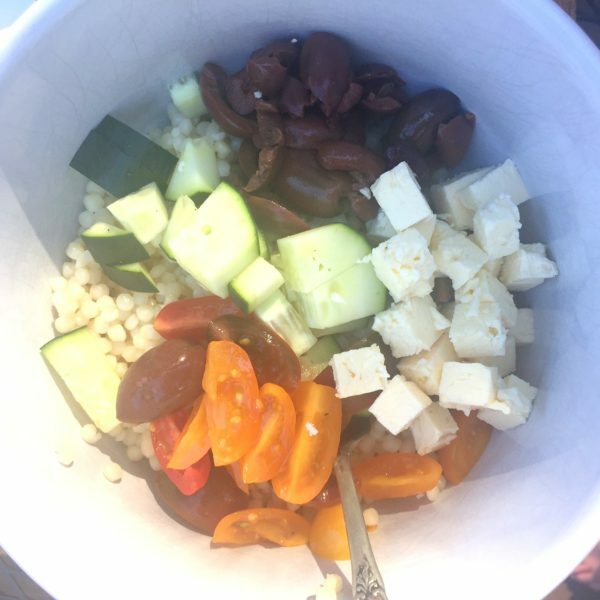 And as it is picnic season, I pulled together a recipe that has made my mouth water each time I have made it this past month. 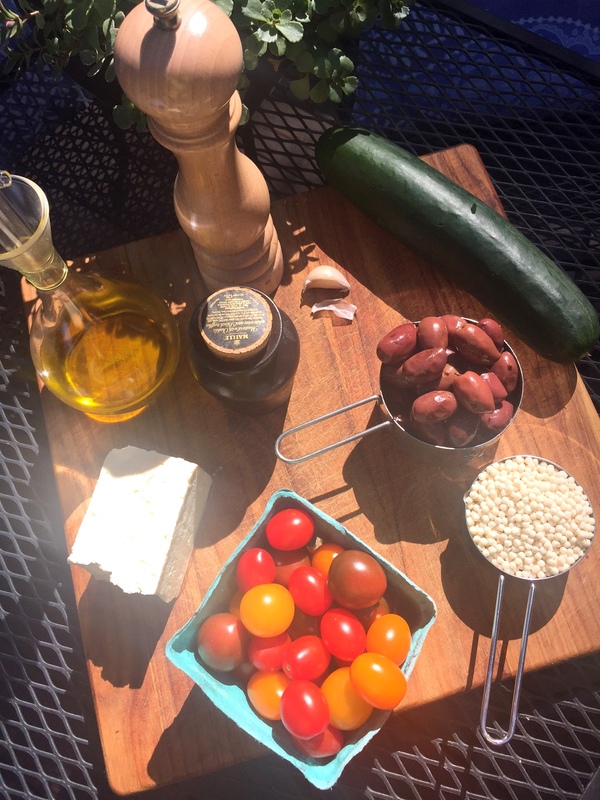 Compiled from a recipe for the dressing adapted from Ina Garten and completed with my favorite ingredients when I think of Greek salads, it couldn’t be simpler and your taste buds will thank you, as will your schedule (it is so simple and quick!). 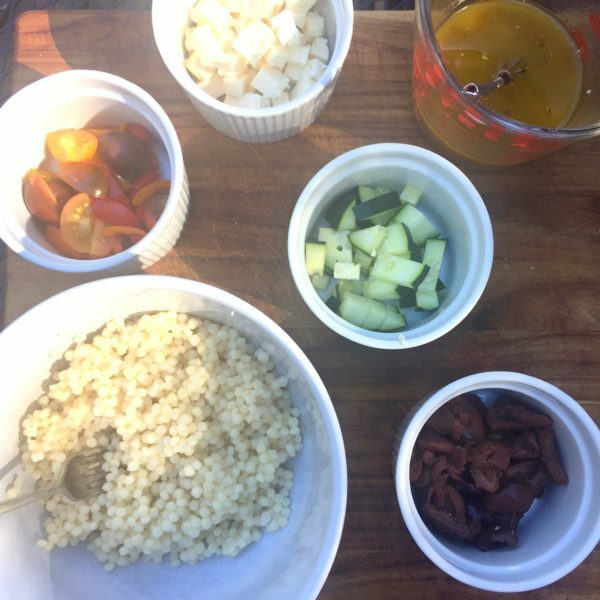 After having made the recipe with Moroccan couscous for the first time in May, I still had a few ingredients in my épicerie left over (see above – the only additions were the two ingredients I needed from the produce stand), so I decided to make it again with Israeli couscous this time. 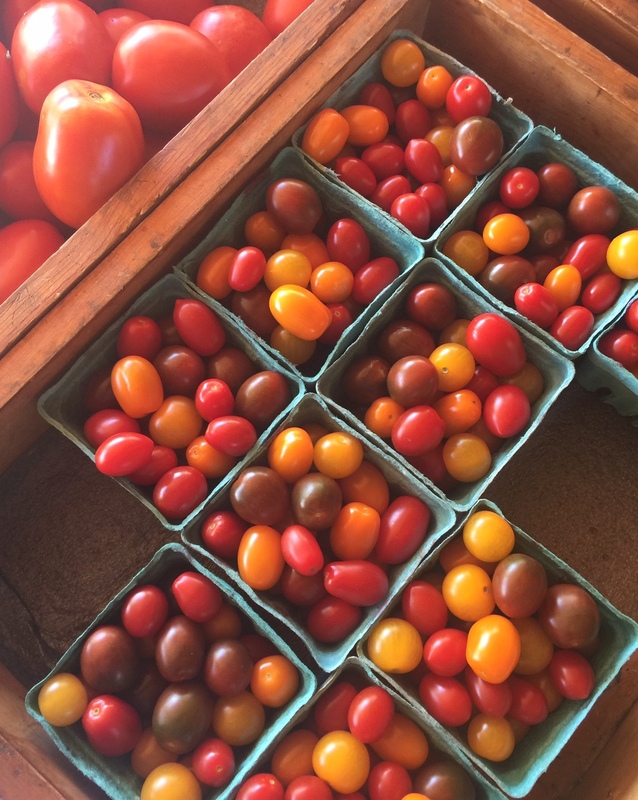 Stopping by the local produce stand, I pick up fresh grape tomatoes and a cucumber. And then I headed home to made a simple dinner as I added grilled chicken tenders for the balance of protein. As you will see in the video below, I made a smaller portion as it was just for me (dinner and then the next day’s lunch). Notice in the recipe, you can change the serving sizes to convert the recipe to exactly the amount of people or meals you wish to make. I love this component of my new recipe plug-in (by the way, it is quite customizable, so if you have suggestions of information you would like me to add, tweaks to be made to make it easier to use, just email me)! Have a look at the video below which takes you from market to table. As you will see, it is simple, and I guarantee delicious. 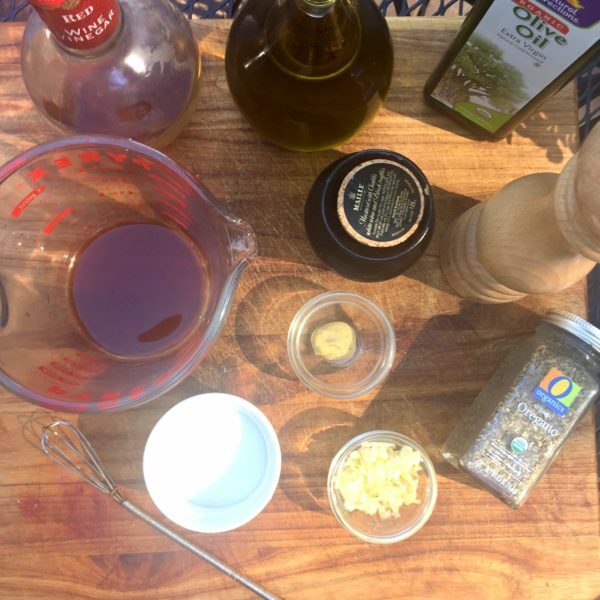 In a small bowl or liquid measuring cup, whisk together the garlic, oregano, mustard, vinegar, salt and pepper. Still whisking, slowly add the olive oil to make an emulsion. Check the cooking time for the couscous per the instructions on the package. Depending upon the couscous you have chosen, time will vary by a few minutes 5-10. Bring the water in a saucepan to boil. Once boiling, add the couscous, unsalted butter and a pinch of salt (optional). Stir once to incorporate. Remove from the heat, cover, and let sit for 5 minutes (again, check the instructions on the package, as different couscous will have different sit times). After resting time, fluff the couscous with a fork. 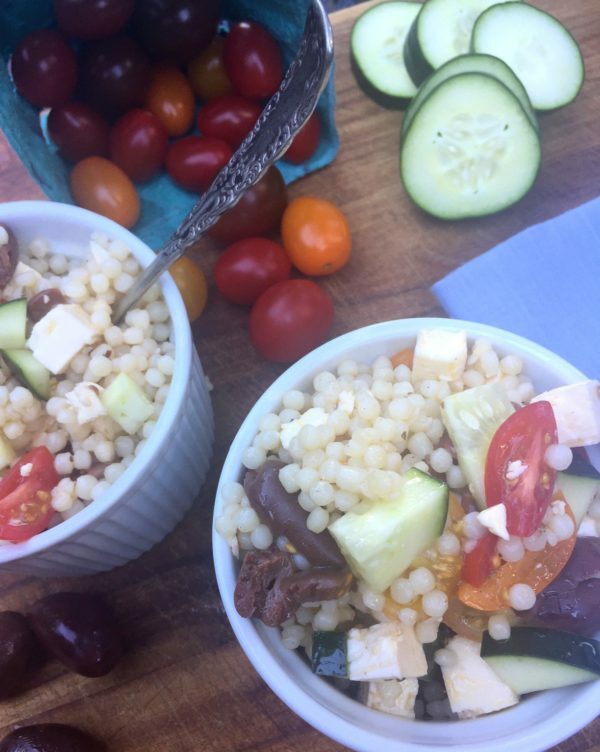 While the couscous is cooking, mix the dressing (see instructions below), dice and slice each of the four ingredients: feta (dice), cucumber (dice), olives (slice/quarter), and tomatoes (quarter). 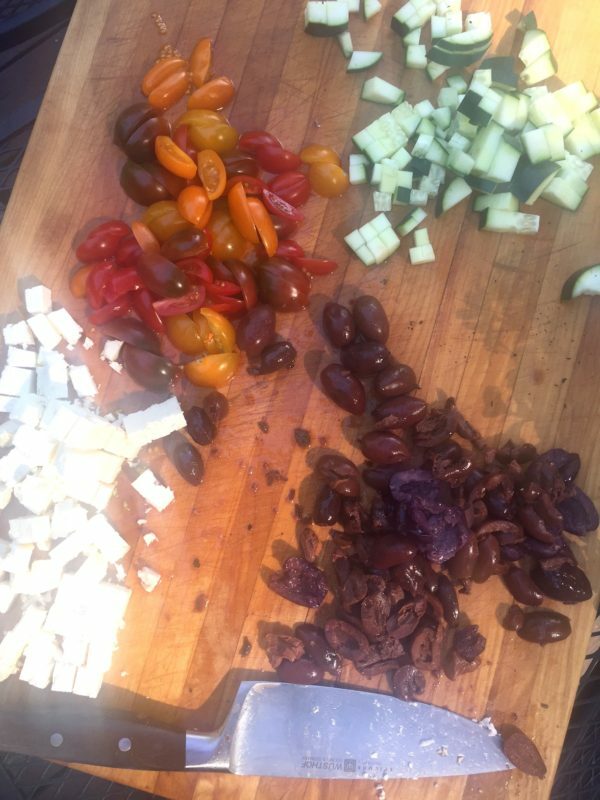 To combine: add salad ingredients (see video), and finish with dressing - add less than you think you will need. Toss salad and taste. If you need more dressing, add. I usually do not need all of the dressing I have made and reserve it for salads throughout the week. Place salad in the refrigerator for one hour. Then serve and enjoy!